※Winners will receive an in-app notice from nana Admin team directly. This is our 1st official international contest by Playing For Change and nana. Collaborate with the worldwide artists from Playing For Change and Win special prizes! This year, Playing For Change has launched their newest video series "Listen To The Music" on their Official YouTube Channel, and the title track "Listen To The Music" from the series has been released this April. This song features 30 musicians from 12 countries including members of The Doobie Brothers — Tom Johnson, Patrick Simmons and John McFee (the originators of the song), Ellis Hall, James Gadson, Char and so many more! Join the worldwide Collab contest, exclusively on nana! 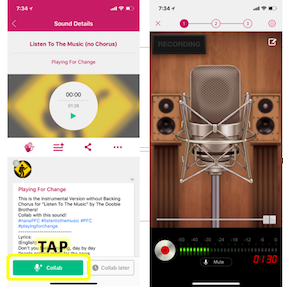 nana is proudly partnered with Playing For Change to connect the world through music. They edited the tracks exclusively for this contest which you can only find them on nana! - Go to the track you want to collaborate on and Hit the Collab button to add your sounds. You can sing solo or sing with the backing chorus. You can also add some harmony or ad-libs to it. You can play your instrumental tracks and build on sounds. ▽ STEP 3: Post with hashtag #nanaPFC!! ❌Posts without the hashtag above will be disqualified. ❌Posts without any singing voice or instrumental sound will also be disqualified. We will carefully hand-select 20 finalists from the entire submissions, and PFC team will choose "The Best Collab Award" and "Outstanding Collab Award"! Founded in 2002 as a shared vision by Mark Johnson and Whitney Kroenke, Playing For Change's mission is to connect and inspire the world through music. 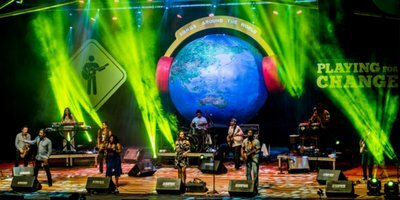 Through their innovative videos called "Songs Around The World" which combines musicians from across the globe collaborating on one song, their traveling band featuring 10 musicians from 10 countries, and the Playing For Change Foundation, the Playing For Change movement uses the power of music to breakdown boundaries and overcome distances between people.